When: Friday, September 13, 2013, 6:00 p.m. to 8:30 p.m.
Where: Stokes, Hamer, Kaufman & Kirk, LLP, 381 Bayside Road, Arcata (near Union and 7th Streets – 7thStreet becomes Bayside Road heading toward Sunny Brae). This is a wonderful venue for art — plenty of parking, surrounded by the forest. What: Landscape Watercolors by Paul Rickard, Oils on Canvas by Yvonne Kern, and Glass Art by Susan Bloch. 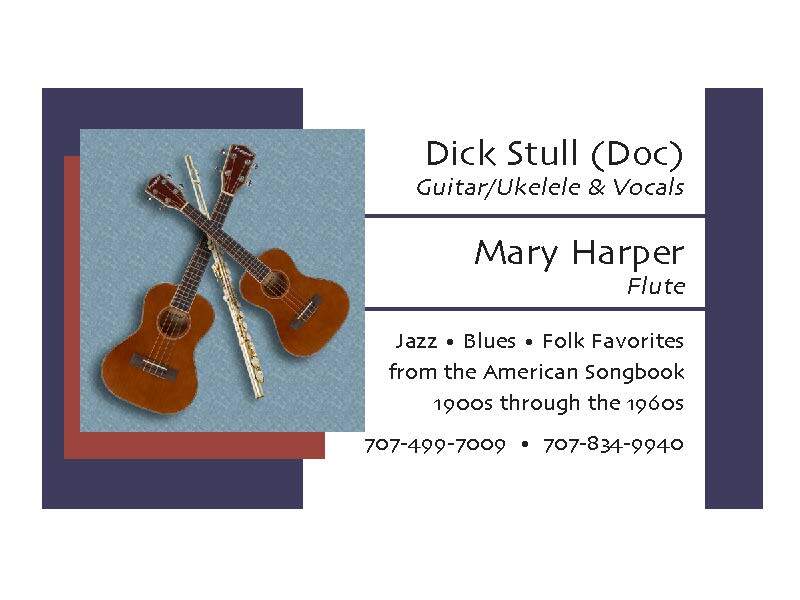 Live Music – Doc Stull (guitar and ukulele) and Mary Harper (flute) take the open road through the American Songbook (with a touch of Brazil). Plus refreshments, wine and fun! !